Antjie, die Rooibruin hen: Knit a Classic Cabled Bag!!! 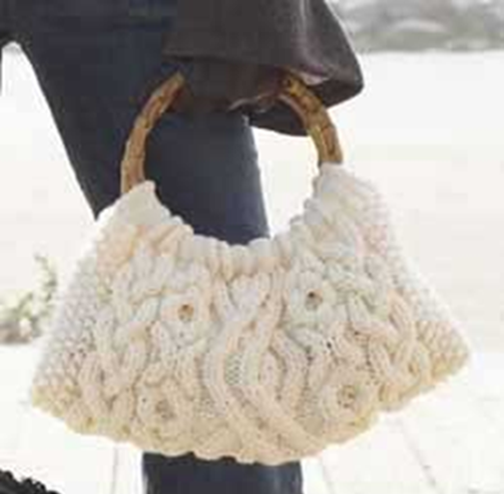 Beautiful bag in classic knitted cables. Measures approx. 16 inches (40.5 cm) wide by 8 inches (20.5 cm) tall, excluding handles. Shown in Patons Canadiana Aran (#00104) knit using sizes 5 mm (U.S. 8) and 6.5 mm (U.S. 10-1/2) needles. Approx 16 ins [40.5 cm] wide by 8 ins [20.5 cm] tall, excluding handles. Sizes 5 mm (U.S. 8) and 6.5 mm (U.S. 10½) knitting needles or size needed to obtain tension. Pair of round purse handles 8 ins [20.5 cm] in diameter. Cable needle. TENSION: 13 sts and 17 rows = 4 ins [10 cm] with larger needles and 2 strands of yarn in stocking st.
C4F = Slip next 2 stitches to cable needle and hold at front of work. K2, then K2 from cable needle. C4B = Slip next 2 stitches to cable needle and hold at back of work. K2, then K2 from cable needle. T3F = Slip next 2 stitches to cable needle and hold at front of work. P1, then K2 from cable needle. T3B = Slip next stitch to cable needle and hold at back of work. K2, then P1 from cable needle. Panel Pat A (worked over 11 sts). 1st row: (RS). P1. T3F. T3B. T3F. P1. 2nd and alt rows: Knit the knit sts and purl the purl sts as they appear. 3rd row: P2. C4B. P2. K2. P1. 5th row: P1. T3B. T3F. T3B. P1. 7th row: P1. K2. P2. C4F. P2. These 8 rows form Panel Pat A. Panel Pat B (worked over 8 sts). 13th row: As 1st row. 15th row: As 11th row. These 16 rows form Panel Pat B. Panel Pat C (worked over 18 sts). 1st row: (RS). P1. K2. P3. K2. P2. K2. P3. K2. P1. 2nd and alt rows: Knit all knit sts and purl all purl sts as they appear. 3rd row: P1. T3F. P2. T3F. T3B. P2. T3B. P1. 5th row: P2. T3F. P2. C4F. P2. T3B. P2. 7th row: P3. (T3F. T3B) twice. P3. 9th row: P4. C4F. P2. C4F. P4. 11th row: P3. (T3B. T3F) twice. P3. 13th row: P2. T3B. P2. C4F. P2. T3F. P2. 15th row: P1. T3B. P2. T3B. T3F. P2. T3F. P1. 17th row: As 1st row. 19th row: As 3rd row. 21st row: P2. T3F. P2. C4B. P2. T3B. P2. 23rd row: As 7th row. 25th row: P4. C4B. P2. C4B. P4. 27th row: As 11th row. 29th row: P2. T3B. P2. C4B. P2. T3F. P2. 31st row: As 15th row. 32nd row: As 2nd row. These 32 rows form Panel Pat C.
With smaller needles and 1 strand of yarn, cast on 66 sts. Beg with a knit row, work 14 rows in stocking st.
1st row: (RS). K5. Work 1st row of Panel Pat A. Work 1st row of Panel Pat B. Work 1st row of Panel Pat C. Work 1st row of Panel Pat B. Work 1st row of Panel Pat A. K5. 2nd row: K1. (P1. K1) twice. Work 2nd row of Panel Pat A. Work 2nd row of Panel Pat B. Work 2nd row of Panel Pat C. Work 2nd row of Panel Pat B. Work 2nd row of Panel Pat A. (K1. P1) twice. K1. 3rd row: K1. (P1. K1) twice. Work 3rd row of Panel Pat A. Work 3rd row of Panel Pat B. Work 3rd row of Panel Pat C. Work 3rd row of Panel Pat B. Work 3rd row of Panel Pat A. (K1. P1) twice. K1. Last 2 rows form seed st pat at sides. Panel Pats A, B and C are now in position. Cont in pat, keeping cont of Panel Pats, until 32 rows of Panel Pat C have been worked twice. With smaller needles and 1 strand of yarn, beg with a knit row, work 14 rows in stocking st. Cast off. Mark position on each side edge 4 ins [10 cm] up from cast on edge and 4 ins [10 cm] down from cast off edge. Fold Bag in half, matching markers. Sew side seams from markers to fold. Fold cast on and cast off edges through handles and sew in position to last and first rows of stocking st to secure handles.